My mother-in-law Viki called me earlier today and asked what I thought about having a co-ed wedding shower. “Awesome!” I told her. Dividing the attention with Collin? Still getting presents? Sounds like I’m making out like a bandit. She checked in with Collin, he approved, and plans started hatching for a super-chill BBQ shower. 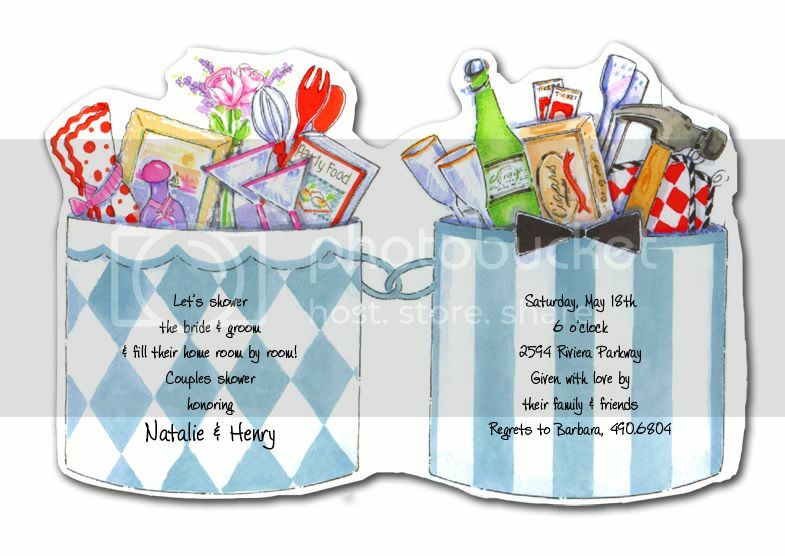 And then she headed out to a stationary store with a friend and fellow shower-host and looked at invitation options. “What could be so upsetting about shower invitations?” I asked. Stupid question. Whenever the wedding world has the opportunity to bewilder, irritate, and outrage, it finds a way. Tickets to public events (presumably to use with his buds, because womenfolk should stay in the homestead). Other hardware, but most importantly: HAMMERS! Spoons. Anything that lets us stir! Standing mixers. For motorized stirring! Chopsticks! Cheese Graters! Other things that will make us feel less alone in the kitchen. Recipe books for party food so we can be great hostesses. Napkins. Ladies are neat, and love things made of fabric! Martini glasses. GIRLS’ NIGHT! WOO! Men’s gifts and women’s gifts are so different that they should be physically segregated, preferably by buckets. 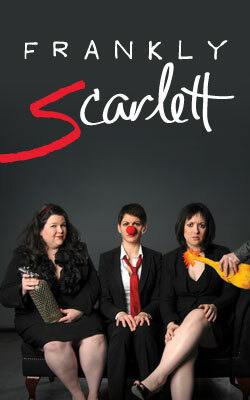 Otherwise those flighty ladies might start stirring something with a hammer! Can’t have that. 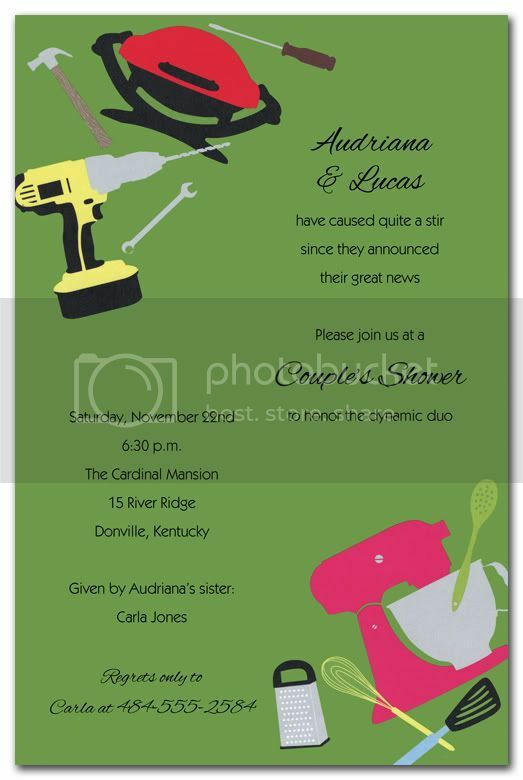 I assume what is going on here is that a wedding shower is considered a girly event, so invitation designers are trying to restore the included groom’s masculinity. What better way to do this than by reminding the guests how even though this groom is going beyond his traditional role of “just showing up” on the wedding day, he still has a Y-chromosome, one that constantly yearns to hammer something. 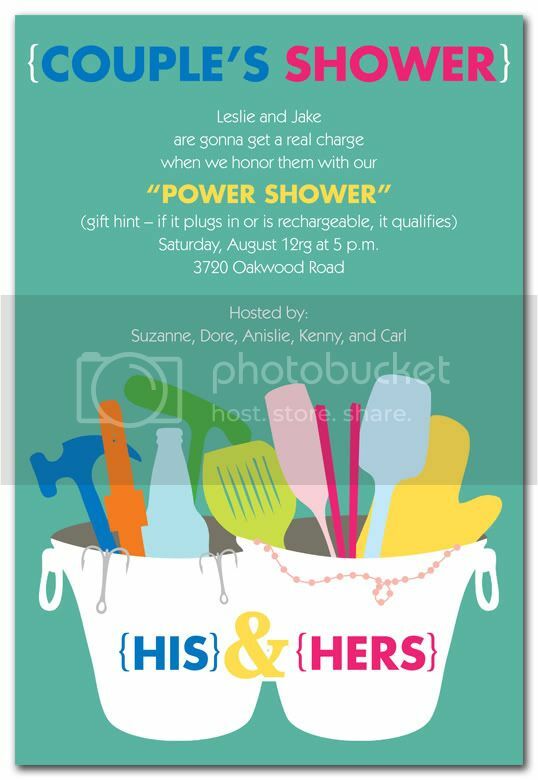 Fortunately, Viki tells me she found a couple’s shower invitation that doesn’t involve creepy gender policing. Which is great, because we really don’t need another hammer, and I don’t want people buying Collin one just because they think it’s the secret to saving his masculinity. *you can get these at your showers? What do people buy for the wedding? So one of my most treasured hobbies is making pies, and at some point I considered buying myself a standing mixer to facilitate pie-making. At the time I was deeply, profoundly single, and I talked myself out of buying the KitchenAid by thinking of it as marriage-bait: if I refused to buy a standing mixer while single, I’d have to find someone to settle down and register with. That’s jacked, I know. Also, man, now I want to register for an XBox. @Button – Best comment ever! “But we already have a Kitchen Aid” has made me chortle for quite some time! I agree, I was looking around for a thumbs up or like button there. This is for real why I don’t want to have a wedding, ever. Robin — I’m counting on you to give me faith in such an event. Annie, I promise I will shepard you toward the sanity-saving parts of wedding planning and away from the brain-breaking parts. Haha, my best friend’s new-at-the-time boyfriend gifted us with a rolling pin and a hammer for our wedding. Luckily, the rolling pin was earmarked for my husband and the hammer was for me. We decided that my best friend could keep dating him. UMM hello! I like rum too! Sounds to me like this designer was a pretty crappy one. Very uninspired and probably not really into weddingish things at all. Perhaps time to change jobs! that is not right, no ma’am. glad she found some, though…hammers…cooking…why don’t we just go ahead and all agree that in 2010 there are no “typical” gender roles anymore. c’mon. And now it is 2011! Typical gender roles had their death rattle in the “two thousand and…” years. I enjoyed this post more than mere words can express, so I suppose I’ll just stop typing the words out now even though I feel like I haven’t contributed anything witty or insightful to this comment thread. Like, I could say, “OMG, the wedding world is full of zany gender-divisive things that make your head hurt!” But you already stated as much, really. So, yeah. Gonna go stir something now, I guess. You are such a cute. I’ll buy you a hammer for valentine’s day! Take that patriarchy! When Jessica and I went out to register, and I started to fill out various forms, I was met with hesitation and awkwardness. The BRIDES are supposed to be the main ones in charge of registries, not the grooms. It’s pretty much like that every step of the way. And I alternate between being aggravated and amused by it all. Ugh those are awful! Yes, girls cook and boys use power tools, let’s not cross these stereotypical gender lines. I am constantly annoyed by society (and people in our lives) assumptions about how we are supposed to be as “woman” and “man”. When I insist I am not a certain way just because I am female, I am usually responded to with a “yeah right”. Refreshing wedding post as always. PS: Have a great shower! good to know pink and blue is not just for baby shower invites anymore! yuck, why can’t they just show a big bucket of stuff everyone likes??? wheres the hammer in my bucket?? ?